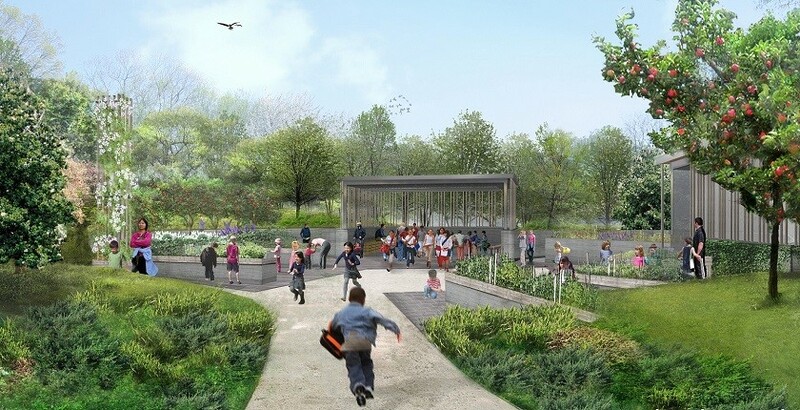 In June 2015, Brooklyn Botanic Garden (BBG) will unveil its new Discovery Garden, a one-acre space for children to explore plants and ecosystems through hands-on play and scientific investigations. The naturalistic, immersive design by award-winning landscape architecture firm Michael Van Valkenburgh Associates (MVVA) models habitats found in the greater New York area—woodland, meadow, and marsh—interlaced with meandering paths and boardwalks that allow visitors to slow down and observe nature; horticultural plantings in the Hamm Children’s Learning Courtyard; and a colorful four-season entrance garden. The Discovery Garden is part of BBG’s continuing Campaign for the Next Century, the most significant garden renewal effort since the Garden’s founding over 100 years ago. At four times the size of its former site, the new Discovery Garden can accommodate the growing number of children who visit BBG each year, with expanded programing targeting children ages 1 to 12. Accessible throughout the year, the new Discovery Garden is designed for all children, families, and school groups. Drop-in education programs, portable field guides, interactive science activity stations, and other dynamic tools encourage children to make their own discoveries in the space. Interpretive materials introduce easy techniques for children—and their caregivers and teachers—to continue to engage with plants in parks, urban streets, backyards, and beyond. For more than 100 years, youth education programs at BBG have inspired kids to learn about plants and become lifelong advocates for the environment. Today, the Garden serves more than 150,000 children every year through classes, drop-in activities, interpretive displays and guides, and a range of formal education programs that complement STEM curriculum standards in schools. Designed by Michael Van Valkenburgh Associates (MVVA), the new Discovery Garden features a network of trails that connect microcosms of natural plant communities. In the Meadow, winding, intimate paths through tall meadow grasses and flowers create the impression of immersion in a wild habitat. Native plantings in this section, including little bluestem, side oats grama, butterfly milkweed, and rattlesnake master, attract butterflies, bees, moths, and hummingbirds and allow children to learn about plant-pollinator relationships. In the Marsh, young naturalists follow a circuit of split logs and boulders as they explore the flora and fauna of this rich environment populated with species that have adapted to living in or near water such as sweet bay, summersweet, sedges, ferns, and rose mallow. The Woodland, the largest area in the new Discovery Garden, includes both deciduous and evergreen forest communities, including beech, oak, and maple trees, lady’s slipper orchid, ferns, dogtooth violet, and trillium. Raised boardwalks and platforms allow children to explore the forest habitat from a variety of vantage points. These trails segue into horticultural plantings in the Hamm Children’s Learning Courtyard and a four-season garden. The Hamm Children’s Learning Courtyard, with a pavilion designed by MVVA in collaboration with Architecture Research Office (ARO), is an area where children can enjoy hands-on gardening experiences with soil, compost, and food plants. The four-season garden allows children to explore a sophisticated display of beautiful plants—such as artichoke thistle, pigsqueak, blue star, bear’s breeches, and bulbs—with their senses. A public festival celebrating the opening of the Discovery Garden will take place on Saturday, June 6, 2015. BBG will also celebrate the opening with its spring gala and special summer 2015 programming including special programming for school groups, plant mystery tours of the new garden for kids, and nature play meet-ups for community partners. Programming for adults will include sensory plant walks, “plant nerd” tours, and botany lectures for adult audiences. The Kid’s Guide to Exploring Nature—published in 2014 and part of the Brooklyn Botanic Garden Guides for a Greener Planet series—serves as a companion to the Discovery Garden’s programming. Created by BBG’s expert education staff, the book explores ecological concepts with lush, scientifically accurate illustrations, thought-provoking, fun activities for every season, and fascinating facts that will inspire young readers to look closely at the world around them. Michael Van Valkenburgh Associates is a landscape architecture firm that creates environmentally sustainable and experientially rich places across a wide range of landscape scales, from city to campus to garden. Founded in 1982, MVVA maintains offices in Brooklyn and Cambridge, Massachusetts. Its earliest works, primarily gardens, plazas, and other smaller institutional projects, were critically celebrated for their groundbreaking achievements. In the next decade, MVVA’s commissions expanded to a scale in which it was possible for landscape to drive urban form, with projects such as the master plans for Waller Creek and Princeton University and built work like Brooklyn Bridge Park and the Alumnae Valley Landscape Restoration. MVVA continues to design small-scale landscapes such as the recently completed Monk’s Garden at Boston’s Isabella Stewart Gardner Museum. Working closely with urban planners, architects, engineers, and ecologists, MVVA has emerged as an innovative leader of multidisciplinary urban design teams. The firm’s collaborative approach ensures that the experience of MVVA’s built landscapes grows from, and is supported by, outstanding environmental performance, financial resourcefulness, technical innovation, and material expression. About the Campaign for the Next Century BBG’s Campaign for the Next Century supports a suite of new and enhanced gardens, facilities, and programs created in response to increased attendance at the Garden, ongoing revitalization in Brooklyn, and growing interest in urban horticulture and sustainability. Other notable projects include the extension of the Native Flora Garden (2013); the new Visitor Center (2012); and the new Herb Garden (2010). The new Discovery Garden is part of the South Garden Project, an ambitious series of renovations at the southern end of BBG that will improve the visitor experience and enable the institution to operate in a more environmentally sustainable fashion. They include the relocated and expanded Discovery Garden; an expanded and redesigned public entrance at Flatbush Avenue by Architecture Research Office; a new Early Spring Garden; renewal of the historic McKim, Mead & White brick archway; a relocated and expanded indoor café and outdoor food kiosk; a new Water Garden; and completion of a larger water conservation project. Further information about the opening of Brooklyn Botanic Garden’s new Discovery Garden will be announced in early 2015.